Traditionally, relationships between testing and coding teams often bordered on frosty. But the wall has started to come down, especially in organizations that have embraced agile principles, values, and practices. Following an "I-click-therefore-I-Program" methodology does not lead to quality software. Good code can and should evolve from clear, up-front descriptions of the solution to the problem at hand. Software developers are not typically at the top of the organizational chart. Yet in some cases, developers are able to wield their knowledge and control of the code to hold management hostage to the developers’ own agenda. How can you avoid being taken hostage and losing control of your company and its software? If a customer asked you to demonstrate to him, within an hour, that your newest software is ready for use, what tests would you run? 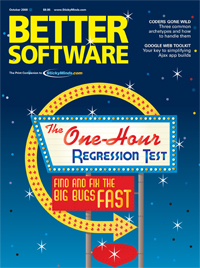 Are these the same tests that you are now performing in your first hour of regression testing? They should be. There is much more to empowering your team than simply stating "You're empowered." Consider the three Ws of empowerment: "what," "when," and "why" when creating boundaries that define which decisions are the team's and which need management approval. Excellent testing starts by questioning the mission. So, the first step when we are seeking to evaluate or enhance the quality of our test coverage is to determine for whom or what we're determining coverage. One way object-oriented systems address the maintenance problem is by using "implementation hiding." Clients of an object shouldn't be dependent on its inner workings--they should only have to know how to talk to it.